Augher (from Irish: Eochair meaning "edge/border") is a small village in County Tyrone, Ireland. It is 18 miles (29 km) southwest of Dungannon, on the A4 Dungannon to Enniskillen road, halfway between Ballygawley and Clogher. It is situated in the historic barony of Clogher and the civil parish of Clogher. The 2001 Census recorded a population of 399. The town gives its name to the local Gaelic Football Club. The historic core of the village developed in linear form along Main Street and is intersected by the A4 road. Augher is a busy community in the Clogher Valley. In the village is the quaint old station house for the Clogher Valley Railway, which has since been converted to a coffee house.Once a year the famous Clogher Valley Show is held which displays the high quality farm produce of this very rural area. 'Clogher Valley Cheese', which is locally made is one of the region's food specialties. On the outskirts of the village is Fr.Hackett Park, home to Augher St.Macartan's GFC. By the time of the Nine Years' War Augher was important enough to be used as a garrison town by the forces of Lord Mountjoy, Elizabeth I's Lord Deputy of Ireland, to disrupt the army of the Earl of Tyrone. In 1613, after the war and as part of the Plantation of Ulster an area of 315 acres (127.5 ha) around Augher was given to Sir Thomas Ridgway who had been the Treasurer at War for Ireland. The land grant was strict about what the Undertaker i.e. Ridgway, could do with the land in terms of who had to be settled there and what provisions had to be given to the settlers. Ridgway was successful in developing the town that within two years it awarded a borough charter by James I. By 1630 the ownership of Augher had passed to Sir James Erskine and during the Irish Rebellion of 1641 the castle was successfully defended against rebel attack. In retaliation the rebels massacred all the English inhabitants in the area. On the death of Sir James Erskine, Augher Castle and the estate passed into the ownership of the Richardson family who retained the estate well into the 19th century. The castle itself burnt down in 1689 but was restored and extended in 1832. Spur Royal Castle stands to this day. Under the borough charter, Augher returned two members of parliament to the Irish Parliament, a practice that continued until the abolition of the parliament in 1801. The borough was by the time of the abolition of parliament owned by John Hamilton, 1st Marquess of Abercorn and when the parliament was abolished he received £15,000 compensation for the loss of the electoral rights of Augher and Strabane – the other borough he owned. Also abolished at the same time was the civil court established under the charter. To the west of Augher is Spur Royal Castle, a typical plantation tower house (grid ref: H5654). It was built in 1615 by Lord Ridgeway on the site of an older fortress and was burnt in 1689 by the Jacobites as the Siege of Derry was underway. It was restored and extended in 1832 and a large and handsome mansion built adjoining it by Sir J. M. Richardson Bunbury, Bart. The tower house is about 30 feet (9.1 m) square and three storeys high. The entrance is on the east wall with a machicolation above. It was surrounded by a wall 12 feet (3.7 m) heigh and flanked by four circular towers; the wall has been removed, but one of the round towers has been restored; and the entrance gateway has also been removed and rebuilt on an elevated situation commanding some fine views, in which the remains of the old castle form an interesting object: the mansion is situated in a well-wooded demesne of 220 acres (0.89 km2), and upon the margin of a beautiful lake. The River Blackwater, on which the village is built, and the lakes of Dunroe and Fymore amid the hills to the south of Augher make this a good fishing area. Just outside Augher on the Hill of Knockmany stands the famous cairn of Queen Anya, reputed to be over 2000 years old. There are a number of forests in the vicinity, namely Knockmany and Favour Royal Forest. The former is remarkable for its huge stones with inscribed designs of the Bronze Age Tomb of Knockmany. It is arguably the finest example of Megalithic Art in Ulster. According to Irish Folklore Knockmany is the home of 52ft giant Fin M'Coul. St Patrick's Chair and Well, another ancient site, set in Altadavin (the foot of the wood), is reputed to have mystical powers. Augher Railway Station was opened on 2 May 1887 by the Clogher Valley Railway. It is a red brick single storey building built by James Harvey of Enniskillen. The railway closed on 1 January 1942. The original station building became a coffee shop known as Rosamunde's. After a period of being closed, the now Augher Station House Cafe came under new ownership, was refurbished and reopened once more. Eugene McKenna – former Tyrone Gaelic Football Captain in the 1980s and joint manager from 1999 to 2002 was from Augher. He collected three Ulster Senior Championship medals as a player, and represented his province in the Irish Interprovincial Railway Cup Tournament on several occasions. ^ "Augher". Place Names NI. Retrieved 18 March 2013. ^ a b "Augher". Planning Service – Dungannon & South Tyrone Area Plan 2010. Retrieved 13 July 2008. ^ a b c d "Augher". Culture Northern Ireland. Archived from the original on 9 June 2008. Retrieved 13 July 2008. 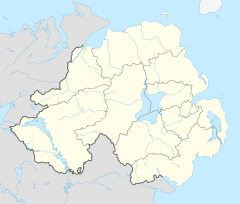 ^ "Townlands of County Tyrone". IreAtlas Townland Database. Retrieved 28 December 2012. ^ a b c d "Augher". A Flavour of Tyrone. Retrieved 13 July 2008. ^ Fry, Plantagenet Somerset (2001). Castles of Britain and Ireland. David and Charles, Newton Abbot. p. 196. ^ "Augher Castle, County Tyrone". Geograph. Retrieved 13 July 2008. ^ a b "Augher station" (PDF). Railscot – Irish Railways. Archived (PDF) from the original on 26 September 2007. Retrieved 8 September 2007. Wikimedia Commons has media related to Augher. This page was last edited on 3 February 2019, at 20:41 (UTC).